Hey Everyone! This post features a few of the latest trends for Spring/Summer 2012. Yesterday while getting ready to hang out with my family and do a little accessory shoping, I decided to play up the color blocking and pastel trend. 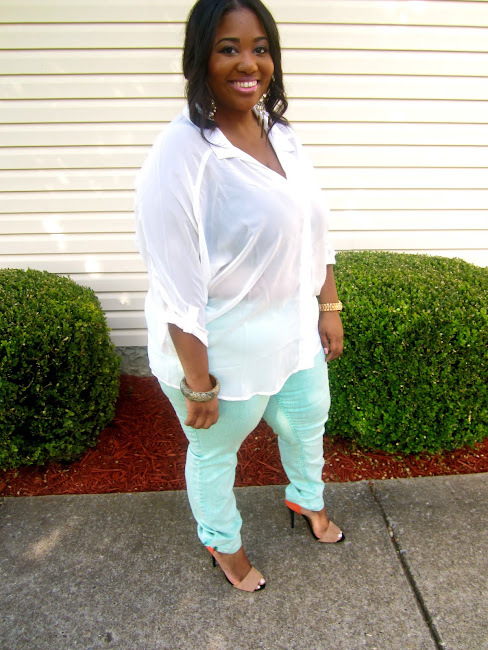 I wore a pair of mint jeans (in love) and a chiffon top. While I could've stopped there, I decided to add another dimension to this spring outfit by adding my favorite pair of shoes of the moment, some color block sandals. I really love the color combination and the way this look came together! What do you think? Love it...you are so beautiful! This is a cute look!!!! Yes hunny! 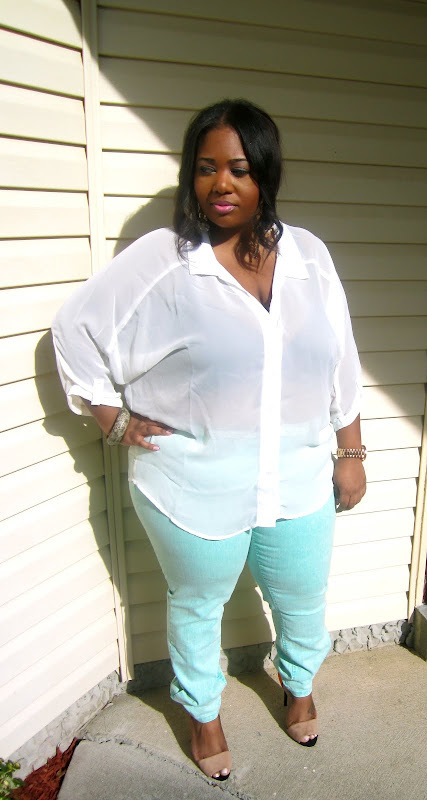 Your fabulous and I love the way you incorporated multiple trends in your outfit. Thank you! The trends are so good this season. Can I have that purse? J/K but I do love it! I too am in love with buttoned downs...If I find one I can wear, I cop it! loving everything of this look!!!!! loving the contrast between the orange part of the shoe and the mint jeans. Definitely a cute look! i think you look gorg but I think you should look into altering you jeans...I'm 5'3 and I have the same prob with the "pooling" of the pants at the bottom...otherwise you look fab! oh this look is everything!! I love this!! I am a fiend for the mint green, its ridiculous. You look casual and sweet. The shoes are an unexpected twist, and they go well. Nice! Thank you! I hope you and your family had a great Easter as well! You look gorgeous! I want some mint jeans so bad! Great heels! This is an adorable look! You look amazing as usual! I've been going back in forth on how I'm going to debut my Zara shoes like these and I love your take on it. Mint green has been my fav color since 2 summers ago. I thought about donning a silk blouse with these shoes also. They're so feminine and dainty to me. 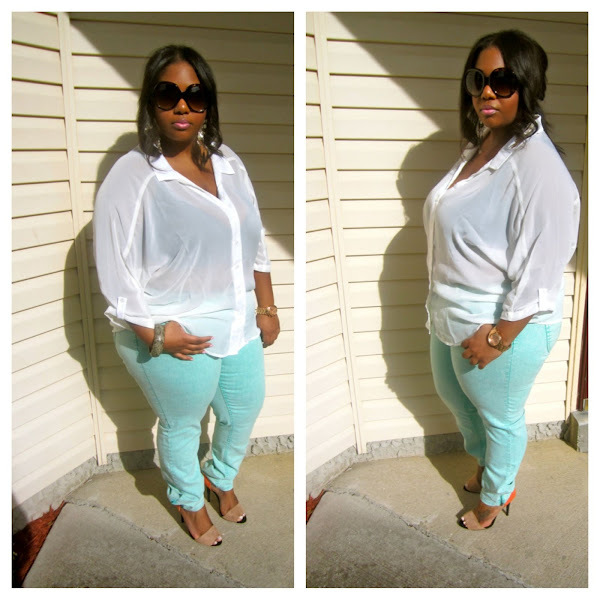 I ordered a few colored skinnies for the spring and summer and mint is definitely on the list. Thank you! I am loving these shoes, getting every color! Where did you purchase your colored jeans? I need some that are short lol. I ordered mine from a few places. I ordered some from one stop plus (here are the brand I got: http://tinyurl.com/cbtgyqr), alloy.com, and forever 21 (those are long so I had to tuck those). I am 5'0 so I have to always buy petite pants. That's why I prefer dresses and skirts mostly. Those heels are BADDDDDD! I might just have to break down and get a pair or two! LOVE LOVE LOVE! 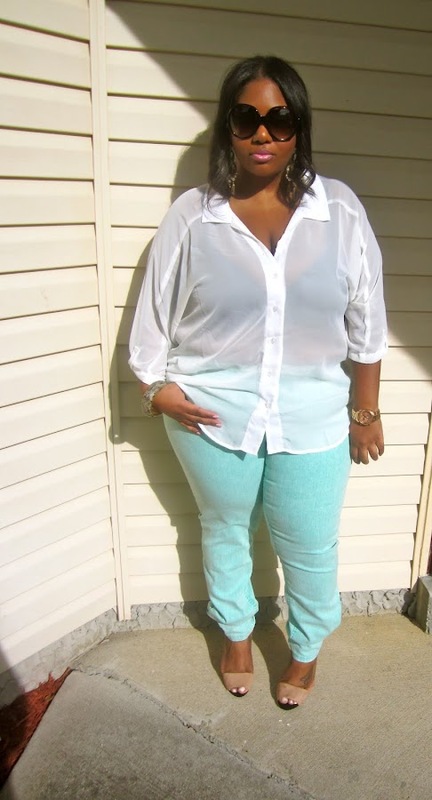 love the look,the mint jeans are nice. I def need to get that top very cute been looking for one all over. Absolutely fabulous combo! Love the color.of those jeans. Hot look hunni! you are looking great! how are you losing weight so fast??? what's your secret? Those jeans and those shoes = perfection ! I got it about a month ago.